Not to be confused with Charles Barkley. 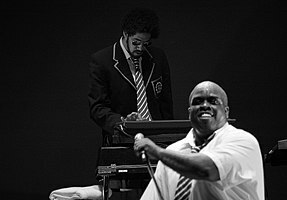 Gnarls Barkley is a music group with DJ and music producer Danger Mouse and American rapper Cee Lo Green. The group had a hit song in 2006 with Crazy. Rolling Stone later named the song as one of the "Best Songs of the 2000s". Gnarls Barkley has released two albums: St. Elsewhere in 2006, and The Odd Couple in 2008. In 2006 Gnarls Barkley released their first album St. Elsewhere. It went straight to number one in the UK. The album's first single "Crazy" was the best-selling song of 2006 in the UK. The song won a Grammy Award for Best Urban/Alternative Performance in 2007. In 2008 Gnarls Barkley released their second album The Odd Couple. It had a less pop sound than their first album. It was nominated for the Grammy for Best Alternative Album. ↑ ""Cee Lo 'definitely' plans one more Gnarls Barkley disc" - CNN".